In 2016 our church theme is “Making a Difference.” Our goal is to grow closer together and actively welcome more new faces into our church. We have many activities planned for 2016 to help accomplish this goal, as well as a whole year of sermons on topics that will help inspire and guide us along this journey. The first sermon series under this 2016 theme of “Making a Difference” is called: “Joy & Excitement in Church.” We have a reason to be excited! We have a reason to have joy! That feeling of joy and excitement should permeate our worship services, our events, and really anything and everything we are involved in. 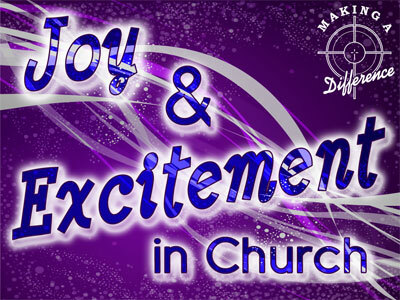 In January we will be looking at why we should have joy and excitement and what that means to MCC. Why Would Someone Choose MCC?